PHUKET: A mature female striped dolphin is in care at the Phuket Marine Biological Centre (PMBC) after being rescued from stranding at a beach on Koh Yao Yai, east off Phuket, yesterday (June 27). PMBC marine biologists were called to the island, about 15 kilometres from Phuket’s east coast, at 9:30am when Wittaya Kongbamrung from the local conservation group Sea Rescue Network reported two dolphins stranded on Klong Son Beach. Both were striped dolphins, PMBC staff confirmed. One dolphin, a baby measuring 140cm long, was successfully released back into the sea, and PMBC staff called on local Sea Rescue Network members in the area to beware of repeat stranding. The other dolphin, an adult female about eight to 10 years old, 214cm long and weighing 70kg, and possibly the mother of the baby dolphin, was not so well. The adult female was weak and had wounds on both sides of the body. She couldn’t swim or control her balance, PMBC staff reported. 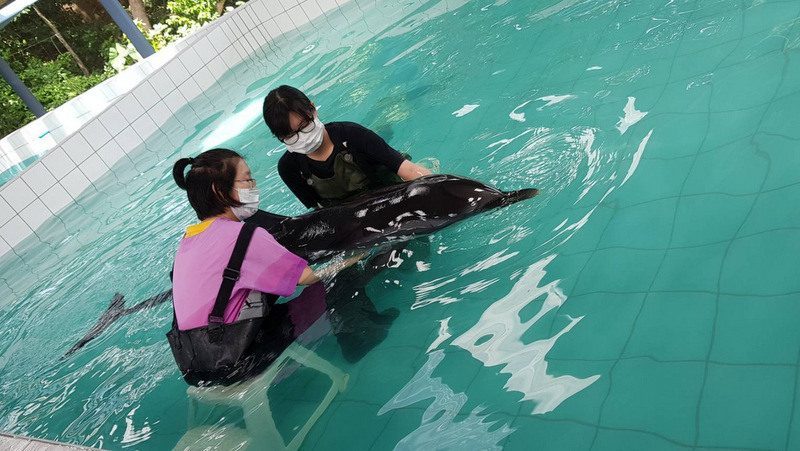 The dolphin was brought back to the PMBC at Cape Panwa in Phuket for treatment and recovery. PMBC staff reported that they are keeping a close eye on the dolphin’s condition and have taken blood samples for testing in the hope of identifying the cause of the dolphin’s illness.